Welcome to the first in a series of posts about awesome apps you can install on ubermix to make it your own! If you are like me, you try to keep tabs on a number of news feeds from a variety of sources, using Feedly or some other RSS feed aggregator. And while Feedly's web reader is fine, it's far from spectacular, especially when used on a touchscreen device, like the excellent Acer Switch Alpha 12 or Spin 7 (both great choices for ubermix). 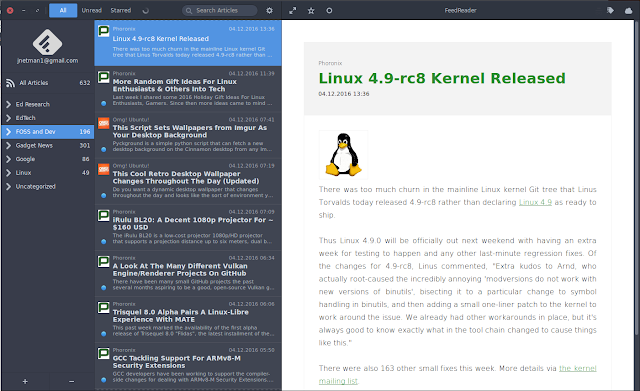 FeedReader is a standalone RSS reader app for Linux desktops that does a nice job of fetching and organizing feed content. It performs all of the functions you would expect, including marking items as read, starred, tagging, and the like, and will even share articles to your Instapaper or Pocket account. And best of all, it caches content, so you can read offline, should you find yourself without an internet connection.